Add USB Male Type A Connector, Just in case you don't have or can't find one. ‍ ‍ ‍ ‍ ‍ ‍ ‍ ‍ ‍ ‍ ‍ ‍ ‍ ‍ ‍ ‍ ‍ ‍ ‍ ‍ ‍ ‍ ‍ ‍ ‍ ‍ ‍ ‍ ‍ ‍ ‍ ‍ ‍ ‍ ‍ ‍ ‍ ‍ ‍ ‍ ‍ ‍ ‍ ‍ ‍ ‍ ‍ ‍ ‍ ‍ ‍ ‍ ‍ ‍ ‍ ‍ ‍ ‍ ‍ ‍ ‍ ‍ ‍ ‍ ‍ ‍ ‍ ‍ ‍ ‍ ‍ ‍ ‍ ‍ ‍ ‍ ‍ ‍ ‍ ‍ ‍ ‍ ‍ ‍ ‍ ‍ ‍ ‍ ‍ ‍ ‍ ‍ ‍ ‍ ‍ ‍ ‍ ‍ ‍ ‍ ‍ ‍ ‍ ‍ ‍ ‍ ‍ ‍ ‍ ‍ ‍ ‍ ‍ ‍ ‍ ‍ ‍ ‍ ‍ ‍ ‍ ‍ ‍ ‍ ‍This is the Solution! 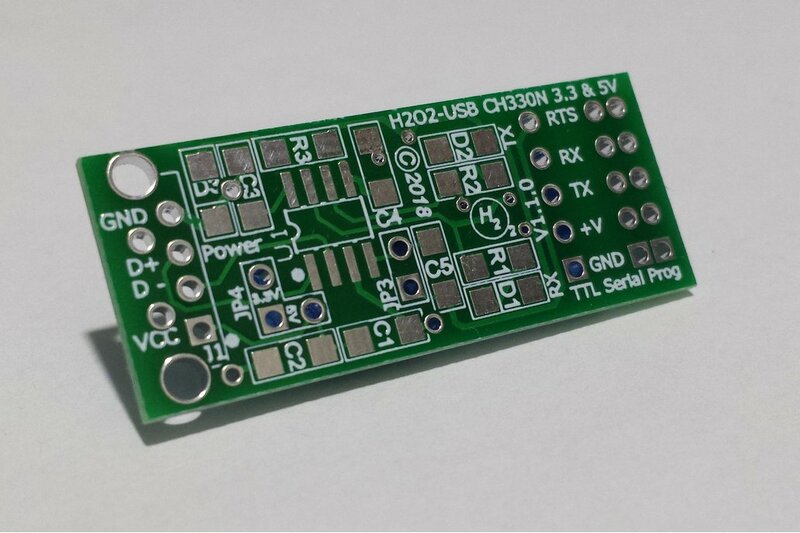 The H2O2-USB CH330N is a USB to Serial bridge so moving serial data to and from the Arduino is as simple as connecting RX, TX and GND, to the CPU's UART or Soft Serial port. Use it to have instant and continual access to your programs data, no more swapping from programmer to data output and back again with each update. It utilizes the CH330N, an inexpensive USB to Serial converter, made by WCH Co Ltd. The design of the H2O2-USB CH330N output connector is fully user selectable. Get the pinout you need in the order you require. 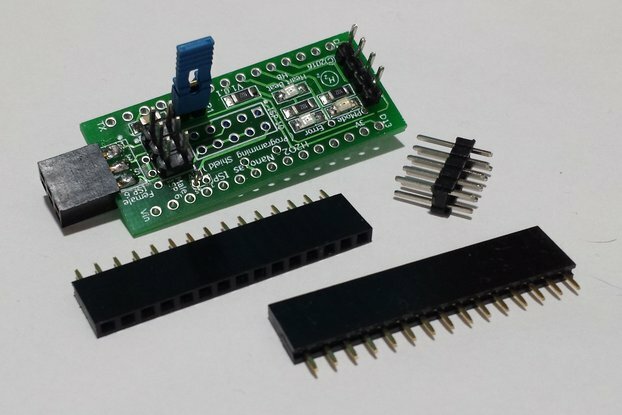 Accomplish this by removing the solder on the Solder Bridged pads, and connecting the needed through hole Via to the needed output position with a jumper wire. The default pinout is [ 1:GND | 2:+V | 3:TX | 4:RX | 5:RTS ]. 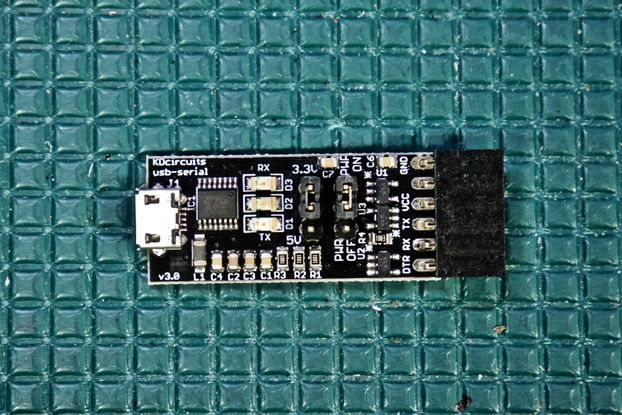 The H2O2-USB CH330N is designed to be compatible with ESP8266, Arduino Pro Mini, a Standalone or your own Bread Board Arduino, even those damaged Arduino Nano, Arduino Duemilanove, Arduino Diecimila, clones with those faulty counterfeit copies marked FTDI can once again be utilized and reprogrammed. If you want a reliable Chip Set that won't maliciously be damage by a simple OS driver update then this is the solution. Fixed Comport number assignment, Each USB hub's port will be assigned a different comport number. This number can be changed within the Windows environment. There are two red LED's indicating activity for RX and TX. They will blink when data is present. The Power indicator is Green and is on when the 3.3V or 5V jumper is selected. I had a need for a small USB serial programmer/data port. That was also versatile and functioned on AVR/Arduino CPU's. Get this Board Assembled and Tested From Here. 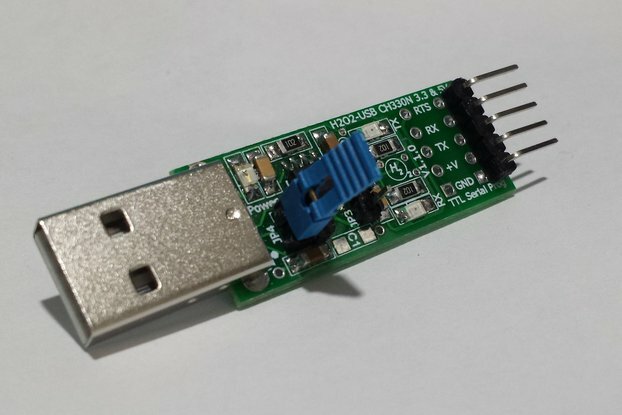 USB Connector can be substituted with a DIY wired USB harness. Simple to interface with MCU. Selectable Power for 3.3V or 5V target devices with UART logic level control signals to match selected voltage. Provides up to 475mA output current at 5V and 250mA at 3.3V. 3.3V is supplied by a AMS1117 Voltage Regulator. USB Male Type A connector Provides a supper strong Connection to Board and makes a USB Cable optional. Drivers: Windows 10/8.1/8/7/VISTA/XP，2000/ME/98 in 32/64 bits. Drivers: Windows SERVER 2016/2012/2008/2003 in 32/64 bits. Drivers: LINUX, support 32/64 bit system. Drivers: MAC OS , support 32/64 bit system. Drivers: Android Host 3.1 and above USB Host mode. All data and modem control pins broken out. 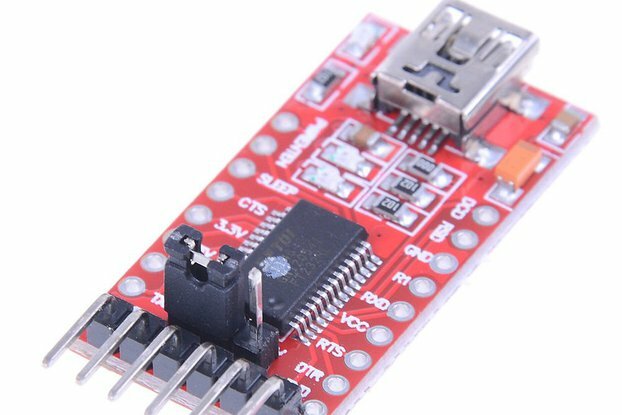 ◈ 1x H2O2-USB CH330N 3.3V & 5V-TTL Serial programmer, The Printed Circuit Board Only, With Optional Parts and or Services as Ordered. See Specs and Docs, BOM Below. Serial Programming is achieved by a simple modification to the Avrdudess configuration file. Would you like to Know More? ‍ ‍ ‍ ‍ ‍○ Serial programming is supported through a normal comport. ‍ ‍ ‍ ‍ ‍○ Read and Write Hex Files of the Flash and EEPROM Memory. 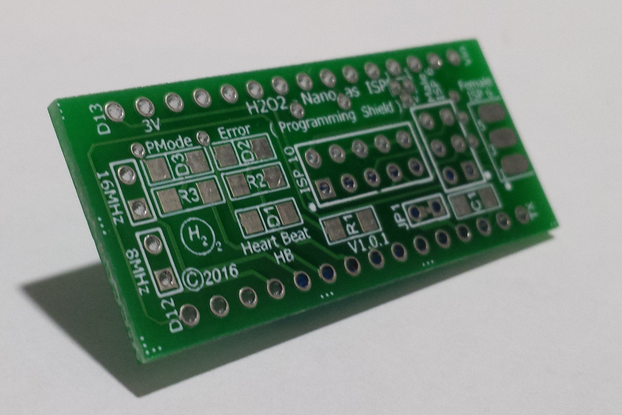 ‍ ‍ ‍ ‍ ‍○ New Programmer will be Added: "#H2O2-USB CH340G/CH340C/CH330N TTL Serial"